Please, send me more information about ref DMD1357 in Marbella Golden Mile or similar properties. An exclusive building of eight apartments in the Golden Mile, at a short distance from the centre of Marbella and Puerto Banús and the prestigious beaches and restaurants of the area of Puente Romano. 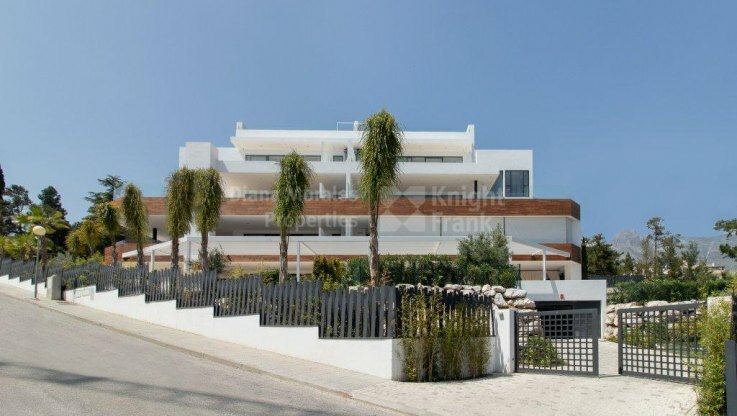 The properties on the ground floor have a private garden of approximately 241.56 m2. It has 3 bedrooms and three bathrooms, private pool, garage and storeroom, the kitchen is fully furnished with Siemens appliances, the building has an elevator, 24 h security, with entrance barrier to the urbanization, security cameras by all the urbanization and the highest qualities. Other characteristics of the properties are: floating wooden floors in bedrooms, cream marble countertops, solid wood interior carpentry, exterior carpentry in dark grey aluminium, double glazing exterior with double glass with protection Solar, floating mirrors with perimeter lighting in bathrooms, glass screens in showers, community water tank with pressure group, electric thermos of 200 liters, sanitary ware brand Villeroy Boch in white, hydromassage bath in main bath, Faucets Brand Hansgrohe single handle, telephone and television points in all bedrooms, living room, kitchen and basement, video doorman, air conditioning cool-heat with individual control per room, radiant floor throughout the house with individual control by Stay, domotics that controls lights on, air conditioning and general shutdown of lighting and air conditioning, 4 sound zones with two amplifiers and loudspeakers in the ceiling, professional WiFi network with 3 access points, alarm system with detectors Infrared in each room, video cameras in lounge and porch, integrated into the domotic system, heated swimming pool with saline ionization purification, gas chimney in living room. The works was completed last november 2017. First Ocupation License available.